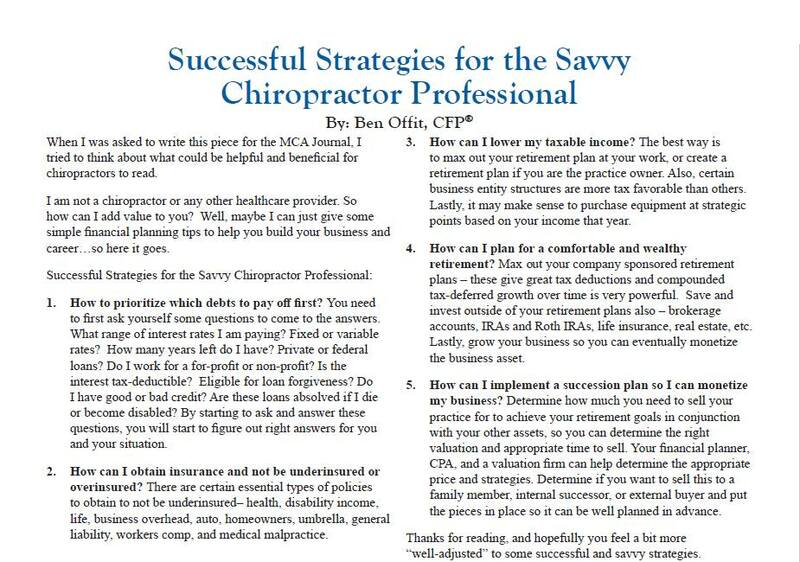 Ben Offit was featured in the Maryland Chiropractic Association journal in September 2017. 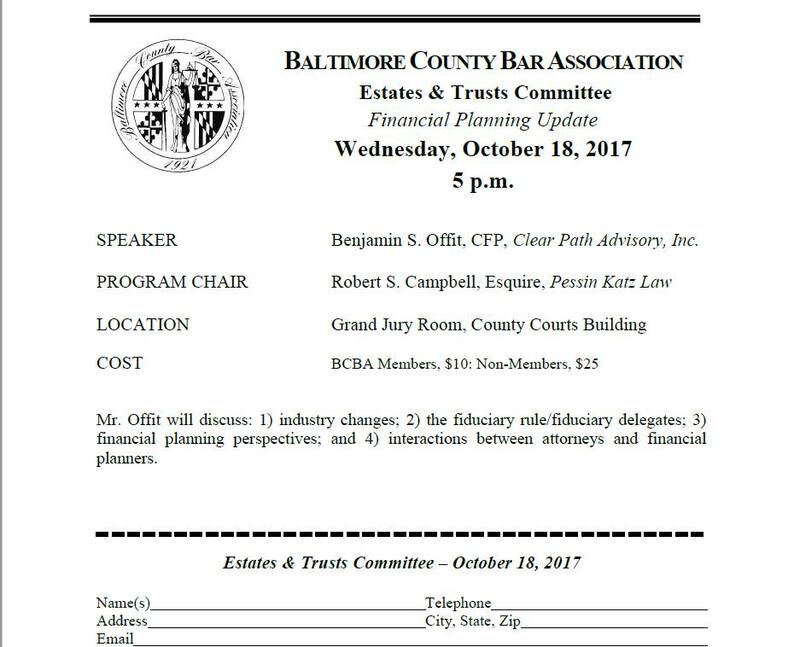 He also will be speaking at the upcoming Baltimore County Bar Association meeting on October 18th. Equities held their own in August, despite hurricanes that devastated several southern states and Puerto Rico, causing extraordinary economic loss. Conflicts both at home and abroad certainly influenced investor sentiment. Clashes between protestors in Charlottesville, Virginia, and escalating tensions between the United States and North Korea dominated the news. Nevertheless, a late-month rally in August pushed equities ahead of their July values. The Russell 2000 decreased from its July closing value as energy stocks plunged. The Dow and S&P 500 posted marginal gains, while the Nasdaq led the month ticking up 1.27%. Long-term bond prices rose, with the yield on 10-year Treasuries falling to 2.12%, or 17 basis points below July's end-of-month yield. Investors regained some of their confidence in September, pushing stocks ahead of their August closing values. Each of the indexes listed here posted notable gains, led by the small-cap Russell 2000, which surged 6.09%, followed by the Global Dow, the Dow, and the S&P 500, each of which closed the month up about 2.0%. The tech-heavy Nasdaq gained a modest 1.05%, yet that index still leads the way for the year, up almost 21.0% over its final 2016 value. Ultimately, investors saw the benchmark indexes make impressive gains by the end of the third quarter. The Nasdaq and the Russell 2000 posted gains in excess of 5.0%, followed closely by the Global Dow and the Dow. The S&P 500 trailed the other indexes listed here, yet still managed to increase by almost 4.0% over its second-quarter close. Crude oil jumped from $46.33 per barrel on the last day of June to $51.64 on the last business day of September. Gold, which had been climbing, fell at the end of the quarter, closing at $1,282.50 — still ahead of its June closing price of $1,241.10. Regular gasoline, which was $2.288 per gallon on June 26, soared to $2.508 on the 25th of September. The summer saw the economy slow a bit, as inflation remained relatively stagnant, wages advanced only slightly, rhetoric between North Korea and the United States became testy, and Mother Nature blasted the southern states with two very powerful hurricanes. Through it all, the stock market continued to enjoy monthly gains, with several of the benchmark indexes reaching all-time highs. The start of the year's last quarter may see the economy pick up as some economic indicators are projecting. While the Federal Open Market Committee didn't raise interest rates in September, it most likely will do so at least once during the fourth quarter. Employment is expected to remain steady as it has averaged roughly 176,000 new jobs per month. Do you or your spouse have any undergraduate student loans outstanding? If yes, you may be eligible for a program from the State of MD for free money (in the form of a tax credit) to put towards the balance. The application is due 9/15 each year, so keep this in mind for 2018, or call me or your CPA if you have any questions! Seven years ago, Tesla became the first U.S. automaker to go public since Ford Motors in 1956. When its share price rose above $290 in April of 2017, it became larger than Ford. In a survey of households with investment portfolios worth $3 million or more, 10% credited an inheritance, while 52% cited income from a job or business and 32% credited investments. Hurricanes release as much energy as a 10-megaton nuclear bomb exploding every 20 minutes.